HitchHiker Sidecar Model Line From 1974 to 1997. This is the early style Hitchhiker Sidecar made from 1974 to 1978 in Minnesota. It had a rear trunk lid and 18'' motorcycle wheel and no brake. Later Hitchhiker Sidecar widebody style made in the 1980's to 1997. Most later Hitchhiker Sidecars used a 13'' car wheel and there was an option for a brake. This Hitchhiker Sidecar is missing the taillight. This is the big trunk of the Hitchhiker widebody sidecar. Hitchhiker Sidecar lean control motor and mounts. Hitchhiker Sidecar lean control hooked to wheel under frame. This is the E-Z Lean System motor mounted on the left side of the Hitchhiker Sidecar frame. You could order it as a option in the 1990's. It compensated for the lean of the road or when a passenger sat in the sidecar and compressed the suspension and you would hit a switch and the motor would level the sidecar for better handling. This is the Hitchhiker Classic Sidecar model. It came out in 1993 and was made for the Harley-Davidson motorcycle. It was the last new sidecar model that Hitchhiker Sidecar came out with. Hitchhiker also made motorcycle trailers. The Hitchhiker Classic Sidecar model. Hitchhiker Sidecar frame. They made a few types of frames over the years. You can see the arm rest on the other side, some Hitchhikers had two arm rests. The shock mounted on the right arm rest and had a sliding mounting bracket so you could adjust the suspension but this clamp would slip so now you may want to drill a hole through the bracket and pin it in place. This shows the two lower mounts. The rear mount had two sets of mounting holes for motorcycles with longer frames. The rear mount could also be bolted under the sidecar frame to lower the mount. Hitchhiker Sidecar mounts in place. This 1974 style Hitchhiker Sidecar frame shows how you can update the frame to use new modern slip tube mounts. Weld 1 3/4'' pinch tubes across the front and rear of the frame, then modern 1 1/2'' slip tube mounts can be purchased and bolted right on with the new and much stronger heim joint lower mounts that are in the picture. A convertible top was an option on Hitchhiker Sidecars. This shows the convertible top two support bars that were held on with the black, boat deck hinges. This is a home made top bow support for the convertible top. The sidecar uses a car seat. The head rest is removed when the tonneau cover is used. Thank you to the owner Aaron for the information! Hitchhiker Sidecar tonneau cover aftermarket. This is a mid 1990's Hitchhiker Sidecar, trunk & wheel. It has a lean control and the suspension is raised in the wheel picture. Thank you to Gary S. in Michigan for the great pictures. 1990's Hitchhiker Sidecar air shock. I stock new Hitchhiker Sidecar owners manuals on our ﻿Sidecar Manuals page. Bob Loberg, designer/inventor of Hitchhiker Sidecars. This sidecar is a later experimental Hitchhiker Sidecar. Bob pictured with his wife Monica and one of their two sons, Chris & Tim. 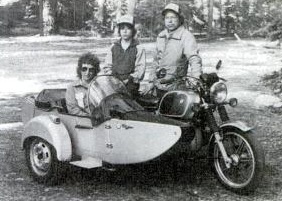 Bob Loberg from Richfield, Minnesota designed/invented the Hitchhiker sidecar. He was a commercial artist and a design engineer. Bob started the Hitchhiker Sidecar Company in 1974 and manufactured sidecars for four years till 1978 when money problems put him out of business. Bob and his wife Monica later became co-vice presidents of The United Sidecar Association. In 1980 Bob Loberg sold the Hitchhiker Sidecar Company to Pat Sheehy and it was moved to 368 London Road West Jefferson, Ohio. When the health of Pat Sheehy failed in May 1989 the Hitchhiker Sidecar business was closed and put up for sale. The company was then sold later in 1989 to Paul Williams and moved to 1665 Cumberland Road SE, London, Ohio. Paul Williams introduced a new Hitchhiker Sidecar body style in 1993, The Hitchhiker Classic for Harley-Davidson models and Paul manufactured sidecars and cargo trailers till his health failed in 1997. The Hitchhiker Sidecar molds were sold in 1997 to a motorcycle repair shop owner in Crescent Springs, Kentucky and he never did anything with them and he died in 2001. Have sidecar questions? Please contact us anytime! We look forward to hearing from you.